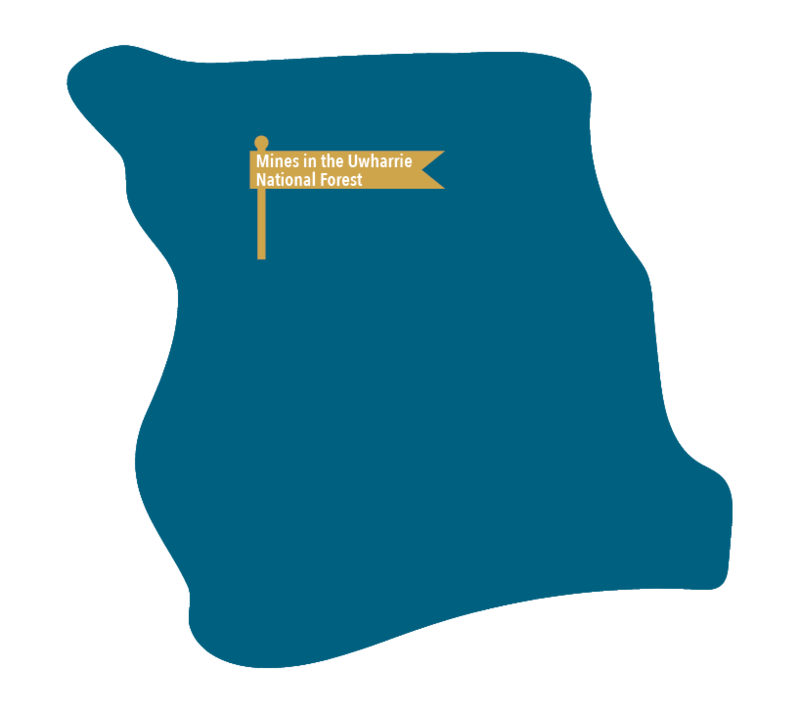 Much of the Uwharrie National Forest is contained within Montgomery County, which has a long history with gold. Today, the Uwharrie River can still produce good amounts of gold and is a fantastic place for panning. The Little River is another great place to search for placer gold. In the northern end of the county, there were several gold mines. Among these sites were Bright, Bunnell Mountain, Deep Flat, Dry Hollow, Dutchman's Creek, Island Creek and Pear Tree Hill and many others that played an integral part in North Carolina's mining history. To read more about the county's gold history and sites that you can still explore today, continue reading below. Recreational panning for gold is allowed on most of the Uwharrie Forest. No fee or permit is required as long as only shovel and pan techniques are used and no significant stream disturbance results. Sluice or "shaker" boxes are allowed, but no mechanized or motorized equipment, such as a suction dredge, is allowed. A wide variety of igneous, sedimentary and metamorphic rock types are found within the Uwharrie national Forest and many individual minerals are found in association with these rocks. As a general rule, removing is allowed to a "handful" of rock, mineral or petrified wood specimens from the surface of the National Forest System Lands. No fee or permit is required as long as the specimens are for personal, non-commercial use; the specimens are not of archaeological value; no mechanical equipment or blasting is utilized; no significant disturbance results and collection does not conflict with existing mineral permits, leases or sales. While the clamor of the gold rush has long since faded through the forests of the Uwharries, prospecting pits, open mines and the ruins of mining operations can still be found in many places. The Russell Mine is located on the present-day lands of the Uwharrie National Forest. The mine has been designated as a site with special historic significance, and the forest staff plans to document, preserve and interpret it. For more information about gold panning, the Uwharrie National Forest or Montgomery County, please contact Market Montgomery Chamber & Tourism at (910) 572-4300; or mscott@marketmontgomery.com or visit marketmontgomery.com. Montgomery County is located just outside of the Charlotte Metro Area and is a local favorite for outdoor adventures and an escape from the bustling city.